I just got this powdery coat yesterday. I'm really trying to by coats and jackets in other colours than black, and even though I was a bit doubtful when I bought it, it's been growing on me through the day. Also it has this loose type of fit that is comfy, but doesn't make me look like a small hobbit like the really oversized coats does. Kinda look forward to wear it next to creamy knits and big scarfs. 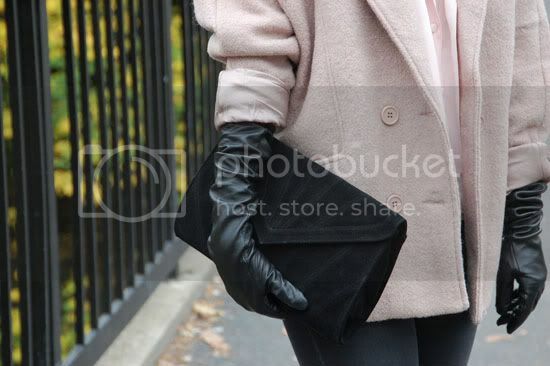 My favourites are the gloves though, as long as I can remember leather gloves has always made me feel very feminine. Maybe cause it reminds me of my mother, and how I held her leather covered hand as a child. Wearing Bik Bok coat, Eurosko heels, vintage silk blouse, Never Denim jeans, glowes and clutch from random purse store. Du var kjempeflott:-) Og jakka var veldig fin!! Fantastisk!! Visste ikke at bik bok jakka så så bra ut på! Love this outfit, the coat is beautiful! Think I'll have to visit Bik Bok tomorrow and try it on.